After conducting extensive research on the Human Capital Management applications market, we are pleased to announce the results of HCM Top 500 Market Report, which ranks and analyzes the world’s 500 largest HCM software vendors by their annual revenues across 22 segments in three primary groups – Core HR, Talent Acquisition and Workforce Management. This report summarizes our research results, spanning thousands of interviews and continuous surveys with HCM vendors, customers and consultants over a three-year period, as we identify some of the most innovative, the fastest-growing, as well as the ones with unparalleled staying power because of their sizable Cloud and on-premise applications revenues after decades of selling Core HR, recruiting and time and attendance applications to millions of organizations around the world. As shown in Leaderboard 1 below, the worldwide HCM applications market reached product sales of more than $15 billion in software license, maintenance and Cloud subscription revenues in 2015. We align the three major groups – Core HR, Talent Acquisition and Workforce Management – with their purpose-built capabilities to help companies identify and recruit talent, manage and evaluate every aspect of Core HR function from compensation to learning, while running a range of other apps to boost workforce productivity. Amid low unemployment in countries such as the United States, coupled with a rapidly aging workforce in many developed nations, HR executives are not only measuring themselves against increased competition for talent, but also searching for the most effective technology solution for enhanced visibility into each and every stage of the employee lifecycle in order to stem attrition, while positioning their organization as an attractive and desirable workplace in the eyes of current and future hires. For this hire to retire continuum to keep running, the challenge remains if HR executives can make do with their current tools – usually a hodgepodge of internally built HR processes layering op top of different back-end systems that might have gone through extensive modifications to fit their needs. The alternative is look to the Cloud for innovation by zeroing in on best-of-breed HCM applications being developed and continuously improved upon by the HCM Top 500 vendors listed in this report. A good example is Mohawk Industries, a Calhoun, GA-based flooring manufacturer recently implemented new HR and workforce management systems in order to better manage its 34,000 employees. For applicant tracking, Mohawk runs iCIMS. For Core HR, it turns to SAP SuccessFactors and for workforce management it uses Kronos. Compared to its old systems, all three vendors have delivered Cloud-based functionality that saves Mohawk time and money, while boosting usability across the far-flung organization covering multiple states and Canada. The use of SAP SuccessFactors for Cloud-based HCM at Mohawk could save the company at least $1.2 million a year, according to Mohawk executives. In addition, Mohawk decided to migrate from an old iSeries system to the Cloud by adopting the latest version of Kronos in order to exploit real-time workforce analytics and eliminate unnecessary employee overtimes. Companies like Mohawk requiring high-volume hiring, creating a consolidated view of tens of thousands of employees and their profiles as well as updating their time, attendance and scheduling records on a real-time basis need to rely on a host of purpose-built applications designed to solve specific problems for each of the 22 functional areas in our HCM taxonomy. Furthermore, some of their problems can best be solved by industry-specific HCM applications like nurse hires at a hospital, contingent labor management at a software company or fatigue risk management for drivers at a logistics service provider. Based on vendor and customer surveys that highlight such industry-specific requirements, we are also splitting the $15-billion market by HCM applications spend across 21 verticals from aerospace to utility. The makeup of these vendors underscores the rich history of selling tools to automate one of the most important corporate functions since 19th century when the industrial revolution ignited almost uninterrupted economic growth and more recently the Cloud revolution now sweeping across the globe. The parallel is striking since the former movement drastically reduced the time to market for many companies. Today, the implications of Cloud software delivery for the HCM market are also boosting the trajectory of relatively young vendors like Benefitfocus, Cornerstone OnDemand, LinkedIn and Workday, as shown in Leaderboards 2 and 3 that rank top 10 vendors in the overall HCM apps market and Cloud HCM. While it took ADP over six decades to become the world’s second-largest HCM apps vendor and the largest payroll solution provider, Workday – capitalizing on widespread adoptions of its HCM applications – has zoomed to become the second largest Cloud HCM player in less than 11 years. As Workday is on track to sign its 2,000th customer in its fiscal year ending January 2017, the 11-year old vendor is closing in on SAP to claim the leadership position in the Cloud HCM applications market. Leading applications vendors like SAP and ADP that specialize in automating the mission-critical Human Capital Management function are racing to meet an array of domain-specific requirements that mirror the complexity of managing people as demographic shifts and work-life balance are upending today’s working population. The question is whether these suite vendors are capable of addressing user requirements at a time when the latest innovation in HR from social recruiting to video job interviews is redefining the HCM competitive landscape. What’s at stake is whether suite or best of breed can deliver better usability, or for that matter greater utilization at the workplace and beyond. 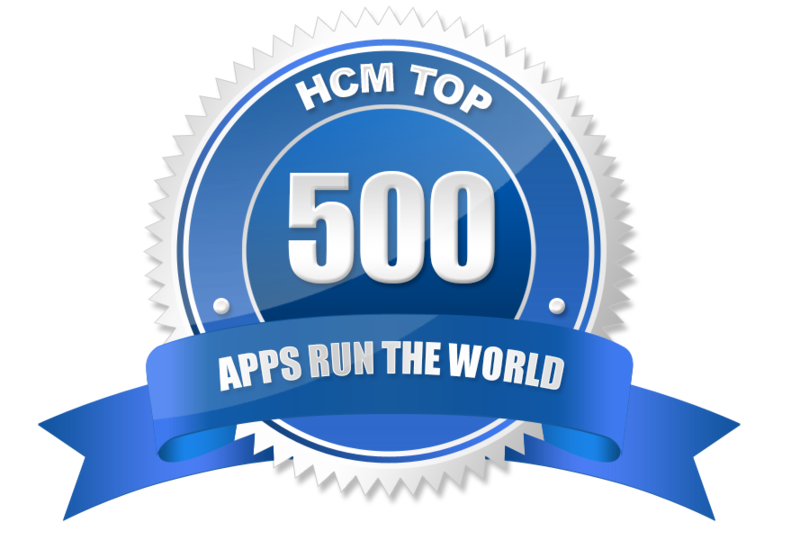 For instance, more than a dozen vendors including InterviewStream, Sonru and WePow that specialize in video interviewing solutions are among this year’s HCM Top 500, in addition to segment leader HireVue. The issue is not whether all of them will prevail, but rather their ability to enlarge the pie so that video interviews would become the preferred method to screen candidates for certain employers. Similarly, new leaders will emerge as different HCM segments continue to expand with growing adoptions of HR software products like contingent labor management for hiring project-based workers at a moment’s notice, continuous employee performance management for gathering real-time feedback, as well as task management for breaking down all kinds of labor activity from preparing food in a commercial kitchen to restocking shelves in a supermarket. All these developments will result in broadening the HCM applications market at the granular level. Leaderboard 4 shows the Nos. 1, 2 and 3 vendors in each of the 22 HCM applications segments in 2015. For other key players, follow the links of these 22 HCM applications segments below and access an index page that lists profiles of dozens or more of other vendors that compete in the same segment. The worldwide Human Capital Management applications market is evolving across different industries as demographic shifts and the increased dependence on services sectors for job growth are leaving the global workforce in a state of flux. In 2015, collectively healthcare, retail and professional services accounted for nearly 30% of the total spend in HCM applications given the aging population, growing consumer spending and increasing demand for specialized professional services have all contributed to job growth in healthcare, retail and professional services verticals especially in fast-growing countries like China and India. Backed by their domain expertise and differentiated offerings, many HCM applications vendors that specialize in strategic verticals are finding accelerated traction. HealthcareSource has made significant inroads into the healthcare vertical signing up over 3,000 customers primarily hospitals by offering them HCM apps tailored for such requirements as nurse hiring. For decades, Jeppesen, a unit of Boeing, has been developing specialized workforce management applications such as crew member rostering for airlines. In July 2016, Boeing signed a deal with Microsoft to modernize such applications in the Azure Cloud to drive down costs and boost efficiency for carriers. In retail and hospitality, HotSchedules has become one of the hottest HCM apps vendors meeting worker scheduling needs of thousands of restaurants. In professional services, Deltek, which specializes in ERP applications for professional services organizations including thousands of architecture and engineering firms, shored up its HCM offerings by acquiring HRsmart in 2015. Deltek was bought in December 2016 by Roper for $2.8 billion as the latter continued to expand in the professional services vertical following its purchase of Aderant for legal management software in 2015. Leaderboard 5 shows the Nos. 1, 2 and 3 HCM applications vendors in each of the 21 verticals with SAP, Kronos and Workday dominating 17 industries in 2015. For other HCM Top 500 vendors that cater to specific industries, follow the links of these 22 verticals below and access an index page that lists dozens or more of other players that have built a franchise in that vertical. If one maps the current working-age of about 64% to the global population of 7.4 billion, nearly 4.7 billion between the ages of 15 and 64 could be end users of HCM applications. Against this vast group, the segmentation of the worldwide HCM applications market extends across geographies. While North America accounted for 58% of the HCM applications market, or $8.2 billion in 2015, EMEA was the second largest at 26%, followed by Asia Pacific with 11% and Latin America at 5%, as shown in the left pie chart below. The pie chart on the right shows the Cloud HCM applications market with similar split with the heaviest concentration in North America at 63%, followed by EMEA at 24%, Asia Pacific at 10% and Latin America at 3%. The same level of distribution can be found among the HCM Top 500 vendors with USA accounting for the most HCM applications vendors at 52%, followed by UK at 9% and Canada at 5%, as shown in the following table with 47 countries being listed in this year’s report. The diversity of our HCM Top 500 underscores the HR continuum that companies are trying to sustain and strengthen, especially those that need to operate in multiple countries. HCM vendors are proliferating around the world to support that strategy. In the fourth quarter of 2016, SAP announced extending localization support for its payroll products to a total of 40 countries including the additions of Egypt and Oman. MOVE-IT, on the other hand, is one of this year’s HCM Top 500 vendors with extensive ties to Egypt. With customers in 12 countries including many Gulf States, MOVE-IT said it is considered the first cloud based HR solution with dual language interface (Arabic and English). For any HR executive working in Egypt with more than 80 million people and a growing array of Cloud and HR options, choosing between a big vendor and a local hero will not be an easy decision. Or take Xceed365 as an example, the Lagos, Nigeria-based vendor has won the support of some of the biggest banks in the country. These tier-one customers prefer to buy from local HCM heroes like Xceed365 capable of delivering extensive support as well as domain-specific in Core HR and talent management products, instead of partnering with others that are not ready to expand in Africa. For HR executives, managing people is a universal challenge. With the advent of mobile technology and the spread of real-time information in split seconds, not running the right HCM applications may well be untenable at best, or detrimental in the worst-case scenario. The purpose-built capability of this year’s HCM Top 500 vendors in 22 functional areas and 21 verticals serves as a game-changing reminder that choosing the right solution may well be the best antidote to a global challenge that could get more complicated for companies regardless of their size and location. Another dimension of our quantitative research process is through continuous improvement of our HCM customer database, which stores more than one million records on the enterprise software landscape of over 100,000 organizations around the world.